The Prague astronomical clock (Czech: Pražský orloj [praʃskiː orloj]), is a medieval astronomical clock located in Prague, the capital of the Czech Republic. The clock was first installed in 1410, making it the third-oldest astronomical clock in the world and the oldest one still operating. The Orloj is mounted on the southern wall of Old Town Hall in the Old Town Square. The clock mechanism itself has three main components: the astronomical dial, representing the position of the Sun and Moon in the sky and displaying various astronomical details; “The Walk of the Apostles”, a clockwork hourly show of figures of the Apostles and other moving sculptures—notably a figure of Death (represented by a skeleton) striking the time; and a calendar dial with medallions representing the months. According to local legend, the city will suffer if the clock is neglected and its good operation is placed in jeopardy; a ghost, mounted on the clock, was supposed to nod its head in confirmation. According to the legend, the only hope was represented by a boy born on New Year’s night. 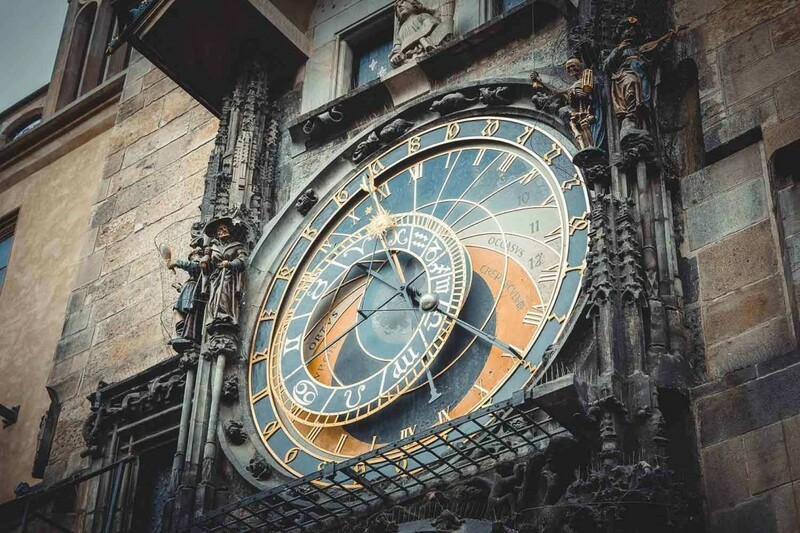 The oldest part of the Orloj, the mechanical clock and astronomical dial, dates back to 1410 when it was made by clockmaker Mikuláš of Kadaň and Jan Šindel, then later a professor of mathematics and astronomy at Charles University. The first recorded mention of the clock was on 9 October 1410. Later, presumably around 1490, the calendar dial was added and the clock facade was decorated with gothic sculptures. In 1629 or 1659 wooden statues were added, and figures of the Apostles were added after a major repair in 1787–1791. During the next major repair in the years 1865–1866 the golden figure of a crowing rooster was added.